As part of BAYADA Home Health Care’s transition to nonprofit and to show gratitude to BAYADA employees for the meaningful work they do, BAYADA Founder and Chairman Mark Baiada today surprised employees with a $20 million gift to be distributed among RNs, LPNs, social workers, home health aides, therapists, associates, client services managers, clinical managers, office support, and other staff among the ten specialties in the 22 states in which the company operates. The surprise took place at the Bellevue Hotel in Philadelphia, PA, just a block away from where Baiada started the first BAYADA service office over 43 years ago with $16,000 in savings and a mission to help people live safely at home with comfort, independence and dignity. During a lunch with 100 employees -- representing a wide range of roles, responsibilities, and tenure -- in celebration of national Home Care & Hospice Month and Thanksgiving, Baiada shocked them with the surprise of a lifetime: he is divvying up the $20 million of his personal funds, based on each employee’s lifetime earnings with the company. Gift amounts will range from tens of thousands for those who have been with BAYADA for many years, to $50 for employees who just started with the company last week. As part of his Lasting Legacy succession plan, Baiada became BAYADA Chairman in August 2017 to oversee the company’s transformational transition to nonprofit and his son, then-practice president David Baiada, was appointed as the company’s Chief Executive Officer. Believed to be the first transition of its kind in the home health care industry, this move to nonprofit is designed to protect the company from sale and help to ensure that BAYADA’s mission, vision, values, and beliefs, codified as The BAYADA Way, will endure for generations to come. Beyond this gift of gratitude, BAYADA continues to give back to its employees who are connected to a purpose and who Love What They Do because it is their calling. As a nonprofit organization, BAYADA will continue to reinvest profits back into the company’s mission and culture, which is a key differentiator in the marketplace. Examples of employee reinvestment include continuing education opportunities to help employees grow in their careers; clinical innovation and technology investments to help employees better do their jobs; recruitment efforts to hire the best and brightest in the industry; and resources to open new offices to serve more people. 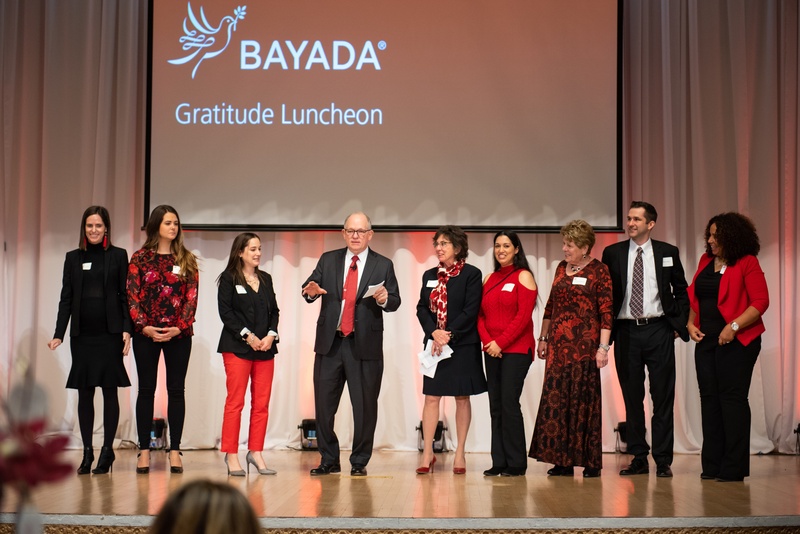 During the event, Baiada acknowledged a number of employees who represent the many committed employees who have helped BAYADA to move toward its Lasting Legacy. These individuals include Devin Jeffers, RN, BSN, who fast-tracked her career through the BAYADA Pediatric Nurse Residency program and works part-time at a hospital ICU; Mat Gunkel, RN, BAYADA’s 2018 Hero of the Year, who is inspired to make life better for his client Dominic, an enthusiastic 16-year old with cerebral palsy and type 1 diabetes; Former Associate Lindsey Conley, who started with BAYADA’s Associate Leadership Development Program, which accelerated her career growth and led to her becoming an esteemed Division Director for BAYADA’s recruitment team; and Client Services Manager Anna Anderson, who has dedicated more than 30 years to tailor-matching BAYADA clients and home care professionals. While this gift is a once-in-a-lifetime gesture, the organization believes its symbolism is a testament to the unique environment Mark Baiada has successfully created, and to BAYADA’s commitment to its employees. “BAYADA is a special company full of employees who are all bonded together in our deep commitment to our clients,” Baiada said. “My wish is that in 100 years, we are continuing to celebrate these incredible health care professionals and the work they do to improve the lives of our clients." To learn more about the company’s pending move to nonprofit, visit www.bayada.com/legacy. To connect with BAYADA, call 1-888-833-5706 or go to bayada.com/contact for a live chat with a team member or to request a return call. Follow the story with #BAYADAGratitude and #ThisIsBAYADA.